Welcome To Your UNA Home! Your opportunity to experience an essential piece of the university experience begins now. Housing & Residence Life invites you to live in a supportive and engaging community that is committed to your personal development and academic success. Apply to live on campus today! 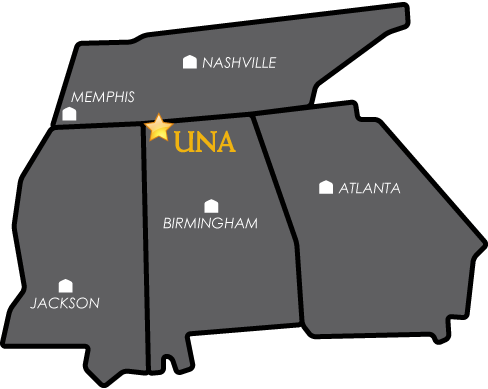 All assignments, updates, and requests are sent to your official UNA email account. It is critical that you check your account regularly. If you cannot access an application upon logging in, please complete an Application Request Form. You will be provided access to an application as quickly as possible. If you complete an application then decide against attending UNA, please complete the Application Cancellation Notice so we may release your room. Your UNA Portal credentials (username & password). This information is provided by Admissions upon acceptance to the University. If you have forgotten your password, please contact ITS to have it reset. Credit/Debit Card for payment of the $150 non-refundable application fee. Please note that this fee cannot be waived. Parent or guardian to authorize the application if the student is under 19 years old. By submitting the application, you are entering a legally binding contract which cannot be terminated unless you opt to not attend UNA in the 2019-2020 academic year. To access the online application and contract, please click HERE. January 7th: Housing application opens for the 2019-2020 academic year. January 7th: Roommate request system opens for the 2019-2020 academic year. Specific roommate requests must be submitted in the same 'round' to be honored. Please see the roommate tab for additional information. March 1st: Round 1: Anyone that submits an application by March 1st will receive an assignment in March. April 1st: Round 2: Anyone that submits an application by April 1st will receive an assignment in April. May 1st: Round 3: Anyone that submits an application by May 1st will receive an assignment in May. June 1st: Round 4: Anyone that submits an application by June 1st will receive an assignment in June. July 1st: Round 5: Anyone that submits an application by July 1st will receive an assignment in July. August: Anyone that submits an application in August will receive their assignment pending availability. Application Status & Deadline: You must complete your housing application and contract, pay the non-refundable fee, and fully submit it in order to receive an assignment. Assignments are made based on the date/time we receive your application. Our halls/apartments fill very quickly and you are should submit an application early in order to receive your preferred assignment. Application Preferences: Each year we receive a significant number of requests for single rooms. We have a very limited number of single rooms available. Applicants that receive a single room based on their application/contract date will be notified of their assignment. All other applicants will be placed with a roommate. Assignment Changes: It is difficult to change assignments once they have been distributed, but requests wil be considered on a case-by-case basis. The University of North Alabama is committed to a policy of nondiscrimination and assignments will be made without regard to race, religion, creed, ethnicity, sexual orientation, or national origin. Special Accommodation Requests: Residents needing a special accommodation must submit an online request after reviewing the information HERE. While there is no official deadline to submit requests for special accommodations, failure to request accommodations in a timely manner may result in a delay of services. Our residence hall assignments process will begin in early spring and accommodation requests received by May 1st will receive priority assignment. We will continue to honor special accommodations as space and availability allow. Freshmen Residency Requirement: Freshmen are required to live on campus for one academic year. Students eligible for exemption must submit an online Exemption Form. If you are requesting a residency exemption, you are encouraged to submit a form upon admission to the university. For more information and access to the Exemption Form, please click HERE. You may request a specific roommate, identify someone based on preferences, or be matched at random by Housing & Residence Life. If you are requesting a specific roommate, you must submit your applications in the same 'round' as defined on the timeline tab. Sign into the Residence application system. Select Term / Fall 2019. Choose "Find Someone You Know"
Enter that resident's roommate code (found at the top righthand corner of the application). Send invite. That person may accept or decline your request. Verify that your match has occurred in the Roommate Group box (right side of screen). You should only select one individual. Answer the questions (referred to as filters) that are most important to you in a living situation and roommate match. Submit. Housing & Residence Life will match you based on the criteria you submitted. Choose the roommate filters that are most important to you! This will help you identify your ideal roommate. You are not required to answer every question - answer too few and you are less likely to find someone you will really enjoy living with - answer too many and you will have less options to choose from. We highly recommend that each student complete their own profile within the application as this will help match you with residents that are most compatible. Also, consider how your habits might change once you've arrived on campus. Do you think you'll stay up late and schedule your classes after 10am? If so, make sure you answer those questions accordingly! You may customize your message when you contact other residents and request that someone be your roommate. Make sure to communicate openly and honestly with your prospective roommate. Please note that all residential students must purchase a meal plan. See the chart below for 2019-2020 Residential Meal Plan Options & Rates. You must choose a Meal Plan when completing your residence hall application, but you may make adjustments through your UNA Portal account or, if on campus, by visiting the cashier's window in Bibb Graves Hall. Meal plan prices are subject to change. Please visit Dining Services for more information. $2,000 per semester for 1,000 sq. ft. / $2, 075 per semester for $1,100 sq. ft.
Can I cancel my application/contract after I submit it? The application and contract is for one academic year, but if you decide against attending UNA (don't because we're really looking forward to you being here) then your contract will be void and you will not be responsible for payment. How do I request a specific person as my roommate? Each person has a roommate 'code' on the top right side of the application. Exchange those codes with your friend and submit your selection on the roommate tab in the application. I signed in, but can't access my application. We'll gladly check to make sure you have access. Just fill out THIS form! When will I find out what my assignment is? We will begin distributing assignments to our current residents in February. New residents will start receiving assignments in March. Check out the timeline tab above for more details. Where will you send my assignment? Understanding your UNA email is half the key to your success. Check it daily. That's where we send the good stuff!